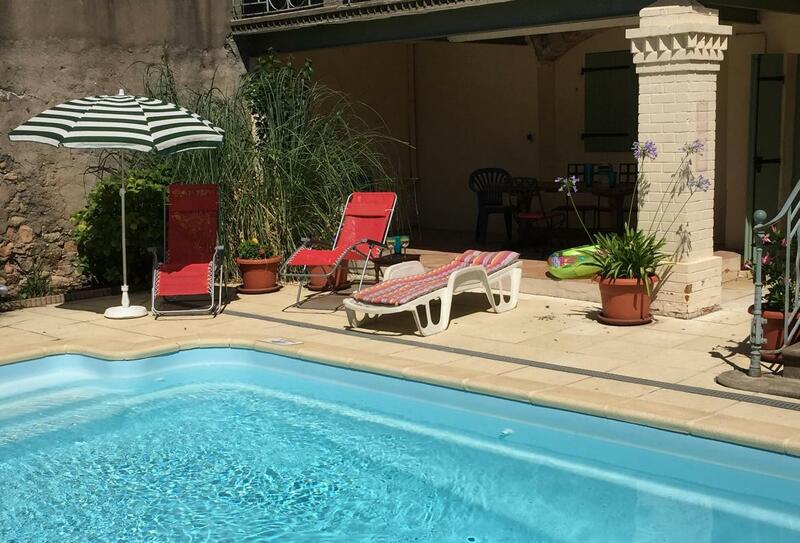 This is the ideal property for families looking to have a relaxing holiday in a lively and traditional village in Southern France, within walking distance to all amenities. The house has been entirely modernised to a very high standard, whilst still retaining many of the original features. From the property, you are within walking distance to boulangeries, charcuterie, Tabac, pizzeria, bar, small grocery shop, bar/restaurant, fruit shop, traditional French restaurant, various shops such as hairdressers and antiques, more restaurants and bars and a winemakers outlet/warehouse which sells very good local wine. You are only 5-minute drive from the nearest biggest supermarket. You can walk down the River Orb within 10 minutes and there is a golf club on the end of the village that is open to the general public, boasting a bar and restaurant. The focal point of the property is the South-facing, fully-enclosed courtyard garden with a private swimming pool. You will enjoy sitting on the terrace on warm sunny days, made complete with a glass of local wine, overlooking the swimming pool and hills beyond. If you want to kick it up a notch, this is the perfect place for an al fresco meal. The house is ideal for teens and children, as it benefits from satellite TV, a DVD player and a games room complete with a table tennis table, table football and a number of board games, as well as internet. On the ground floor, you will find the games room, which is a large room with a vaulted ceiling, table and chairs, double sofa-bed, table tennis table, table football and board games. This room leads onto the garden and swimming pool, as well as a separate WC and shower room, making the ideal hang-out for teens. There is also a large garage providing ample parking. On the first floor is a spacious open-plan lounge and dining area, boasting exposed beams and a very attractive fireplace. There is a comfortable sofa as chairs, a coffee table, satellite TV, a DVD player, a stereo/CD player, internet and a bookcase filled with a wide selection of books, maps and local guides - you won't be short of things to do here! The dining area has a beautiful large oak dining table and chairs, together with an attractive antique sideboard - French windows open onto the South-facing terrace overlooking the pool, courtyard garden and the hills beyond. This is the ideal spot for al fresco dining on the modern outdoor dining table with chairs and parasol. The modern country-style kitchen is situated directly off the dining area and is fully equipped with a dishwasher, fridge, freezer, electric fan-assisted oven and gas hob. There is a large shower room with a shower and sink, as well as plenty of storage, a separate WC at the end of the hall and an airing cupboard where you will find a washing machine. The first and second bedrooms are located on this floor. The first bedroom is a double and is furnished with a King-size antique pine bed, built-in wardrobes and an antique chest of drawers, as well as two bedside tables and a chair. The second bedroom overlooks the pool and courtyard garden and boasts full-size bunk-beds, a built-in wardrobe with shelving, a bedside table, lamp and chair. On the second floor are the third and fourth bedrooms. The third bedroom has a traditional ornate tiled floor, together with twin antique pine beds, a built-in wardrobe, a dressing table, chair and two bedside tables. The fourth bedroom is facing the rear of the property and overlooks the pool with lovely views of the hills beyond. This room has a King-size antique pine bed, antique wardrobe with shelving, 2 bedside tables and a chair. There is also a bathroom which is fitted with a bath, hand basin and bidet on this floor. Once you venture outside, you will come across the private swimming pool of 7.5m x 4m with steps, depth from 1.2m to 1.6m approx. South-facing, the pool has beautiful sunshine on it for most of the day - at sunrise, and as the sun is setting, the walls and neighbours houses create some shade. The courtyard is very traditional and has some palm trees and various Mediterranean plants bordering the swimming pool. If you're looking for an al fresco meal, you'll have a brick-built barbecue at your disposal, as well as a modern outdoor dining table with chairs and parasol. Should you need a little more shade, you could always use the lower terrace that is very comfortable. In resume, the outside space is a walled courtyard (around the pool) which includes a shaded area under the first-floor terrace. The other outside space is the first-floor terrace, that is accessed from the dining room and has external stairs down to the courtyard. The terrace has metal railings and a gate to prevent young ones going down the stairs if you don't want them to. Living Room - fireplace, sofas and chairs, coffee table, satellite TV, stereo/CD player, bookcase with a wide selection of books, maps and local guides. Dining Room - large dining table and chairs, sideboard. Kitchen - fully equipped, dishwasher, fridge, freezer, electric fan-assisted oven and gas hob. Games Room - Table and chairs, double sofa bed, table tennis, darts and board games. Bedroom 1 - King size double bed, built-in wardrobes, chest of drawers, 2 bedside tables and a chair. Bedroom 2 - full size bunk beds, built-in wardrobe, bedside table, lamp and chair. Bedroom 3 - twin beds, built-in wardrobe, a dressing table, chair and two bedside tables. Bedroom 4 - King size bed, an antique wardrobe with shelving, 2 bedside tables and a chair. Large Garage - Ample parking. Situated in the heart of the delightful village of Hérépian within easy walking distance of local shops, restaurants and bars. The village is located on the edge of the stunning Languedoc National Park with numerous activities close by including Golf, Fishing, Walking, Riding and Tennis. The Mediterranean beaches (40 mins) as well as the historic towns of Béziers (30 mins) and Montpellier are all within easy reach. 40 minute drive from the beautiful Mediterranean beaches. The Mountains, Caves, the Lac du Salagou, the Canal du Midi and miles of Mediterranean beaches are all within a short drive. The area is steeped in history with many abbeys, chateaux and cathedrals to visit and discover as well as the famous towns of Béziers, Montpellier, Carcassonne and Nimes. Nimes boasts the best preserved Roman amphitheatre in the world. Just outside the village is the golf course of Lamalou-Les-Bains. The well known Spa town of Lamalou-Les-Bains lies a few kilometres west and offers a good selection of bars and restaurants together with the Casino. The Spanish border and the Pyranees lie just 90 minutes from the house and Barcelona can be reached in 3 hours for a fantastic day trip or long weekend. - The swimming pool is open from 26th May to 21st September so the rental price before and after those dates excludes the use of the pool. - The pool can be opened earlier from mid April at the additional cost of £50 per week. - A gate at the top of the terrace down to the pool for safety. - 2 travel cots, 2 high chairs and 2 baby gates available on request. - Not suitable for dogs. - There is access to the swimming pool from the ground floor games room, which in turn, is accessed from the room at the back of the garage where there are some garden furniture, inflatables and some toys stored. Exceeded expectations. Very good rating for quality of the equipment and cleanliness on arrival. Good value for money and good booking procedure and service.
" The property description and photos were accurate and it exceeded our expectations. It was good value for money and the quality of the equipment in the property was very good. The cleanliness on arrival was good also. Booking was very efficient. It is a great house. "